The Queen of Pentacles suggests that it is important to you that you are able to live independently, with a stable income and with enough time and space to also nurture your family and loved ones. You may be trying to create a better balance between your home and work lives, giving it your all in both domains and trying not to compensate one for the other. At the same time, you are also able to find time to invest in yourself and ensure that you have enough ‘me’ time in between all of your other commitments. The Queen of Pentacles represents prosperity and security. She suggests that you have worked hard to generate a level of financial or physical security which, in turn, gives you the ability to be generous with others and to share your wealth and prosperity with those you love. You have used your financial prosperity to build a comfortable home environment and you are focused on investing in your family, as well as your personal wealth. This Queen asks you to maintain a compassionate, nurturing, practical and down-to-earth attitude when it comes to dealing with others and your present circumstances. You need to focus on creating a calm and balanced life for yourself. You need to be resourceful and practical, dealing with issues as they arise and coming up with realistic and simple solutions that fix the problem with minimal fuss. 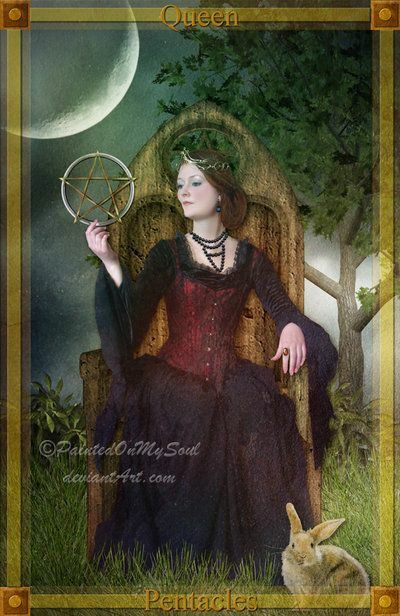 The Queen of Pentacles is also able to find a use for everything in the home, and is very handy and versatile.